Basements are for the whole family – we all want that perfect area that everyone can enjoy. In densely populated cities like London it can be difficult to find more space for your expanding family without uprooting everyone with an expensive house move. So we find a lot of our younger clients decide that a basement playroom is a great solution to accommodate your family’s changing needs. Where children are involved, safety is the most important issue – but that doesn’t mean that it has to be boring and it certainly doesn’t mean that you should sacrifice convenience. We always ensure that there are facilities in such a basement so if you need to use a bathroom, there’s one right there – and if you need to whip up a sandwich for your little one, a kitchenette is included. If the space is multi-purpose we have often included glass walls so that parents can keep an eye on their children while they’re working out in their home gym or working in their office. We love designing basement playrooms – we get to use our imaginations and really think about how the room could be used by children. Whether we are designing big wide open spaces or segmented basement spaces it’s great to see how children use the space – often for a completely different purpose than it was designed for. With London basements costing well in excess of £1,000 per square metre it’s very important that the planning and execution is done by basement professionals who are experienced in producing well planned basements in order to utilise every square centimetre. Storage and functional space is vital for a children’s’ play area to be a success. Our interior designers often go for built in cupboards and shelves to help optimise the space for storage. We have even installed stairs that have hidden drawers in them as well as some other clever options – most of which are a pinterest search away. There are lots of fun ways to make the new space even more exciting for your little ones. Why not do something interesting in the basement design? You could have secret hideaways built in or slides and climbing apparatus. Let you imagination run wild – not all basement spaces have to be sensible and where kids are involved the world really is your oyster. 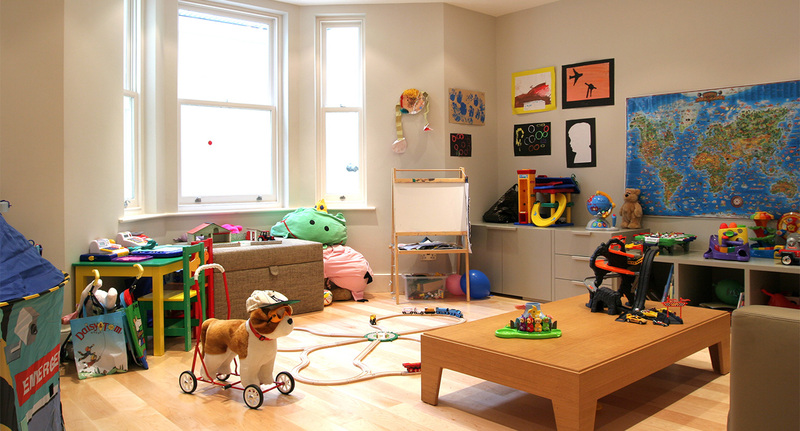 The fantastic basement spaces can be a truly enriching area for your children to learn and play. If you are interested in speaking to us about a retro-fit basement design or would like some advice on how to make your basement ideas a reality make sure you give us a call on 01628 826066 or email us. You can also follow us on Facebook, Twitter, Instagram or LinkedIn.